A contract worth approximately $3.5 million for seven shaft g e n e r a t o r systems has been awarded to the marine department of ASEA Inc., White Plains, N.Y., by Stolt-Nielsen, Inc., the Greenwich, Conn.-based owner and operator of one of the world's largest chemical tanker fleets. Due to be retrofitted in seven Stolt-Nielsen ships, the ASEA systems are expected to result in a yearly saving for each vessel of approximately $150,000. The systems are equipped with static converters and provide output power of 1,200 kva at 460 v, 60 hz. The generators will be coupled directly to the main engine and are designed to operate between 70-100 percent of main engine speed. Included in the package is generator automation for load-sharing and prevention of blackouts, as well as for insuring smooth and rapid changeovers from shaft generator power to auxiliary diesel power, or vice versa. 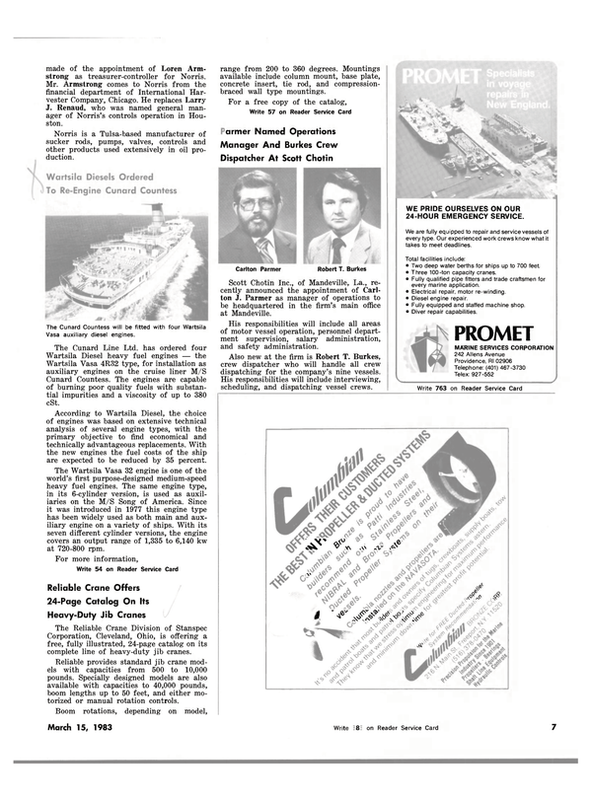 The first system is scheduled for delivery in July 1983.